Le Vas Vase [Le Vas] - $14.95 : NewDaVincis.com!, Great Innovative Products, Gadgets and more. The Le vas? flower vase is a great compliment to every table providing you with the perfect place to display your favorite flowers. The two piece Le Vas? systemÂ snaps together around any pole up to 1 5/8" in diameter allowing you to add this nice centerpiece to every table. 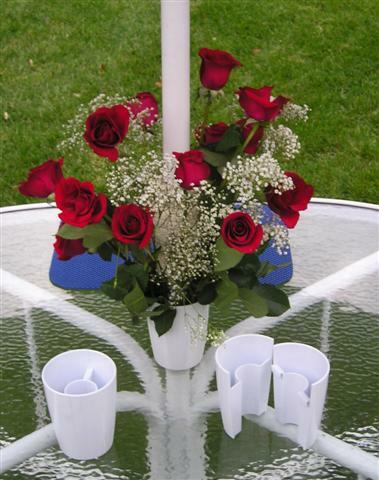 This amazing vase system can even be used when the table has an umbrella coming up through it. You can easily also decorate your deck rails with the Le Vas ! 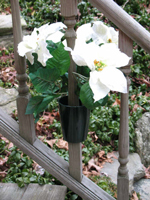 It quickly snaps on to your deck rail stantions and provides instant beauty to your deck. Â The Le Vas? comes in five great colors and is made to be used both indoors and out. This product was added to our catalog on Sunday 23 November, 2008.